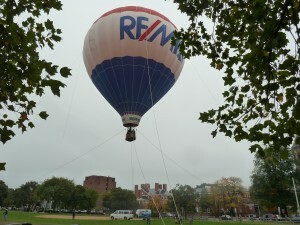 RE/MAX Commercial is coming on strong and we are in the game and growing. 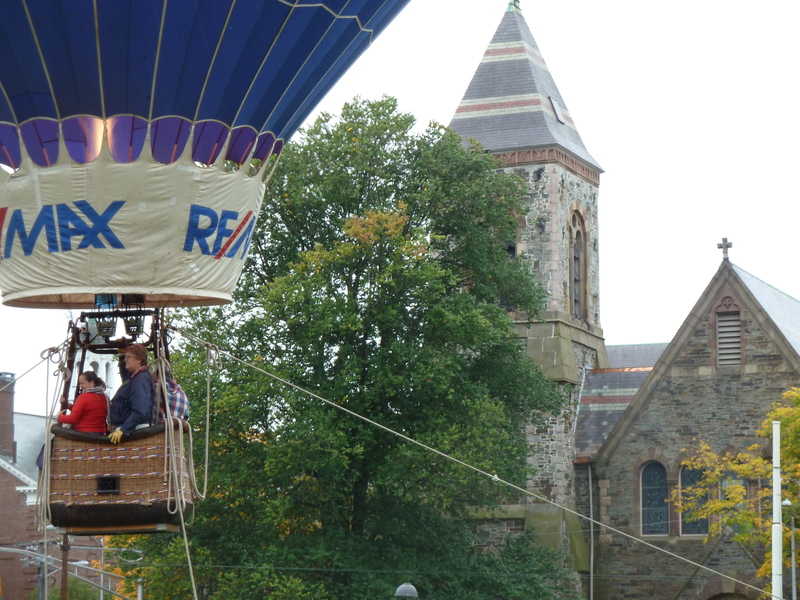 Learn more about the big picture, get insight into our commercial growth and get introduced to the new RE/MAX Commercial Website that has just been launched. A BIG THANK YOU from RE/MAX Destiny to Michaela Hellman for being one of the top fundraisers for the MA Race for the Cure! 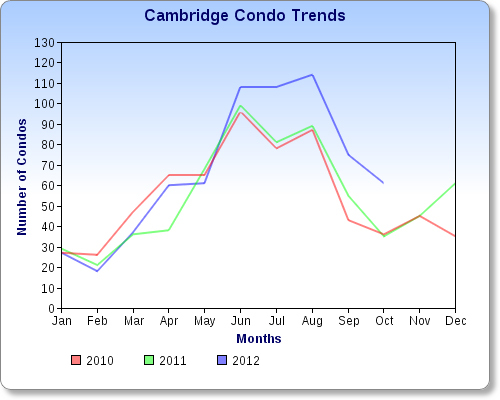 Cambridge Summary: Lack of inventory continues downby 26% compared to October of last year. ~ Condo listing $ volume is down by 15% from $82 million to the current $70 million in market value. 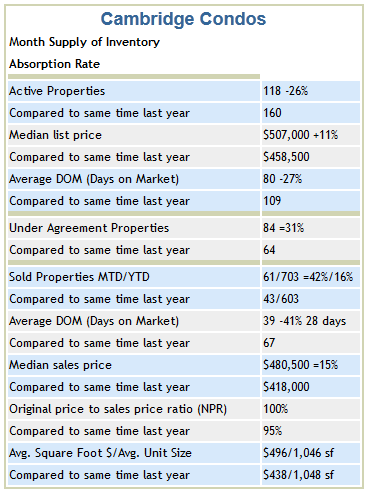 ~ The median list price is up by 11 with days on market improving by 29 days before going off market. ~ Condos that went under agreement for the month improved by 31%. 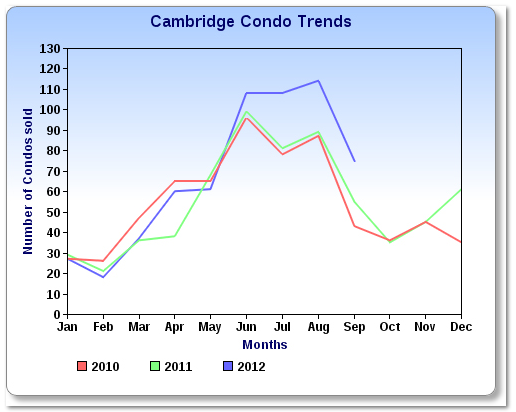 Cambridge condo sales, month to date, are up 42% with year to date number of sold condos increasing to16%. Sold $ volume YTD increased by 16% from $298 million in 2011 to $348 million. The median sale price increased by 15% with the ratio of sale price to original price at 100% due to multiple offer bidding and reduced time on market. ~ The average square foot price for September was $496 per square foot with the average living area at 1,046 square feet. 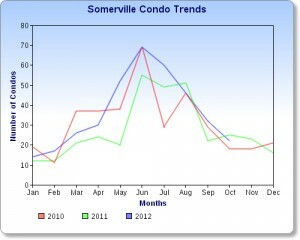 Somerville Summary: September condo inventory remains at record lows, down 51% from a year ago. ~ Listing $ volume down 55% from $55 million to $25 million in value. ~ The median list price decreased by a modest 5% with the active days on market dropping 30 days to under 2 months. ~ Condos going under agreement improved by 58%. 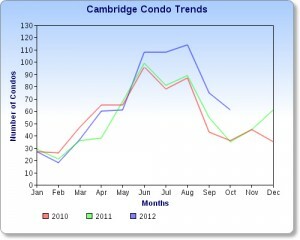 Condos sold for the month were down 11% with the year to date sales up 25%. 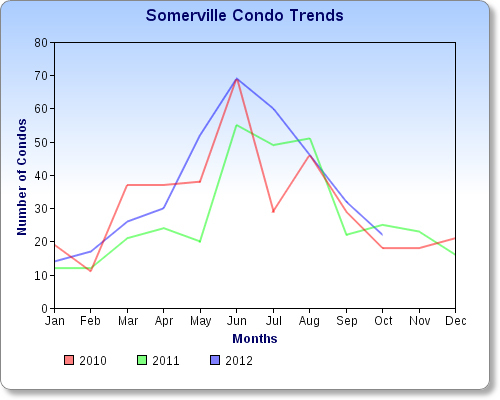 ~ Somerville condo sold $ volume YTD is up 32% from the end of October last year. 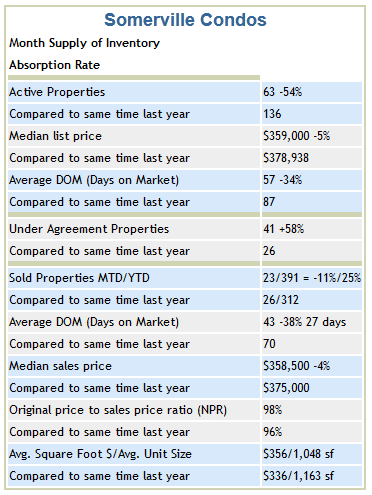 ~ Sold average days on market was less than 2 months and the median price slid by 4%. The original price to sale price ratio remained at 98% of the original list price due to competitive bidding. ~ The average square foot price was $356 per square foot with the average condo living area at 1,048 square feet. 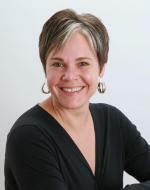 We are very happy to announce that Elisabeth Bolton has joined RE/MAX Destiny. 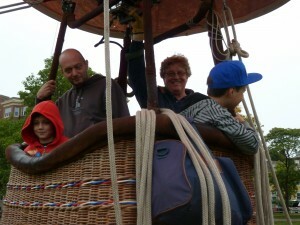 Liz was first licensed in 2000 and quickly became a highly valued member of the Cambridge Real Estate Community. She has a B.A. 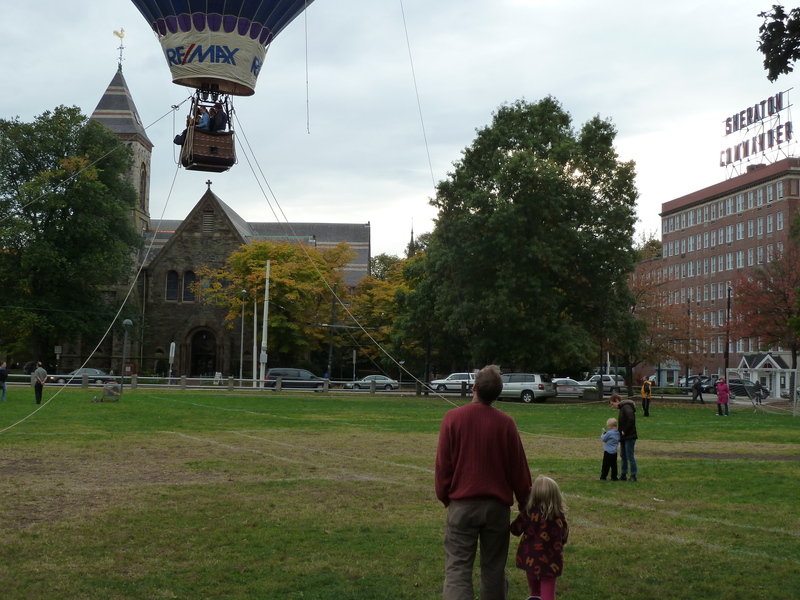 from Wellesley College and received her M.S. from Simmons College. She has obtained a number of designations and specialized certifications including Accredited Buyer Representative (ABR), Certification by the National Trust for Historic Preservation on Historic Property, Certified Residential Specialist (CRS) – a designation held by fewer than 1 in 20 real estate agents. 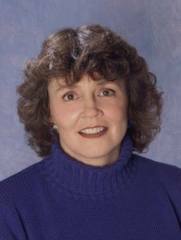 Liz is also a Certified Negotiation Specialist, Certified E-Marketing Specialist and has obtained the Loss Mitigation Certification. As a lifelong New Englander Liz combines local expertise and knowledge with the experience gained from several home renovations which means she has contacts and advice to share with clients contemplating improvements, renovations or additions. Liz quickly connects and establishes meaningful long lasting relationships with her clients. Her considerable success is no doubt due to her energetic and enthusiastic commitment to outstanding service. We are very excited to have her become a member of our team. Somerville Summary: September condo inventory remains at record lows, down 51% from a year ago.. ~ Listing $ volume was down 50% from $57 million to $28 million in value. 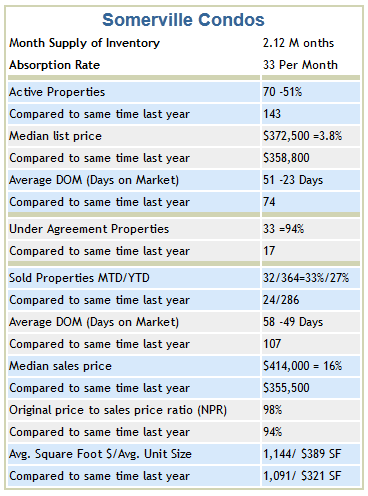 ~ The median list price improved by a modest 4% with the active days on market dropping 23 days to under 2 months. ~ Condos going under agreement were down considerably by 94%. 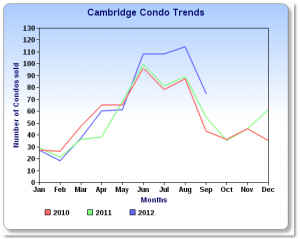 Condos sold for the month were up 33% with the year to date sales up 27%. 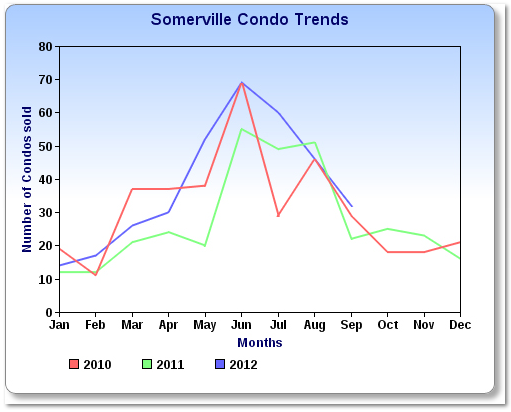 ~ Somerville condo sold $ volume YTD is up 32% from the end of September last year. 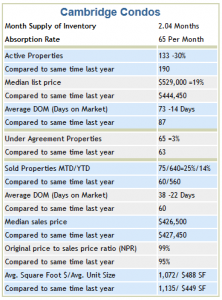 ~ Sold average days on market was less than 2 months and the median price rose by 16%. The original price to sale price ratio increased to 98% of the original list price due to competitive bidding. ~ The average square foot price increased to $389 per square foot with the average condo living area at 1,144 square feet. The RE/MAX of New England August Monthly Housing Report shows continued stability in the market with increasing sales in New England year-over-year and month-over-month. Overall, the number of units sold is up 20.0% year-over-year. Recently, we’ve reported increases in price for almost every state in New England; but, in August the median price was flat with an overall decrease of -0.2%. However, year-over-year, the number of pending sales is up on average 33.0%, with CT experiencing 48.1% growth followed by RI with an increase of 40.1% year-over-year.